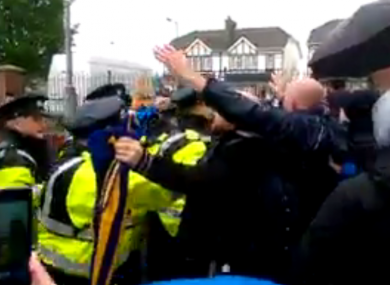 Footage of the Clare Hall protest was published online by the Dublin Says No group. DUBLIN LORD MAYOR Christy Burke has confirmed he met with senior gardaí last night to discuss concerns about policing at protests against water charges on the northside of the city. It follows the passing of a motion at Dublin City Council on Monday condemning the “excessive mobilisation of Gardaí” at a number of estates across Donaghmede, Clare Hall and Edenmore. Twenty-nine councillors, including Burke, voted in favour of the motion, with 20 voting against and four abstaining. Speaking to TheJournal.ie, Burke confirmed that a “positive meeting” with gardaí took place last night and that he “expressed the concerns raised by members of the City Council”. Scuffles broke out in Clare Hall, off the Malahide Road earlier this week as more than 20 officers were deployed to respond to a group of some 150 demonstrators on Elmfield Avenue in Clare Hall. Protesters later accused the force of using heavy-handed tactics. Demonstrations — by members of protest group ‘Dublin Says No’, People Before Profit, Sinn Féin, Éirigí and other groups — have been taking place in various estates across the wider Dublin 5 area since June of this year. The protesters are attempting to block contractors working on behalf of Irish Water from installing water meters, and have been using tactics like blocking pavements and standing in front of construction equipment. A further protest is taking place at the moment in the St Donagh’s estate in Donaghmede today, according to the ‘Dublin Says No’ Facebook page. TheJournal.ie has asked the Gardaí for comment on last night’s meeting and on the Clare Hall protests. A spokesperson said in a statement that the force never comments on meetings “or confirm who we meet with”. An Garda Síochána has a role in ensuring peaceful protest can take place, and also in preventing injury and protecting life. Our objective with any such operation is to ensure the safety of the public. Email “The Lord Mayor met with senior gardaí last night to talk about water protests”. Feedback on “The Lord Mayor met with senior gardaí last night to talk about water protests”.